Susquehanna Borough Mayor Nancy Hurley first became interested in local politics in the mid 1990s when she and a friend organized a rally to support the borough’s police department. The rally attracted the local TV station and over 100 people. After this successful rally Nancy was asked to run for Susquehanna Borough Council and she served on the council from 1998-2001. Nancy served previously as mayor from 2003-2005, ran again in 2014 and was elected to her current term of office. Mayor Hurley served on the Pennsylvania State Democratic Committee for eight years, half of that time as Vice Chair of the Northeast Caucus. This was the first time that a representative from Susquehanna County served in this capacity. 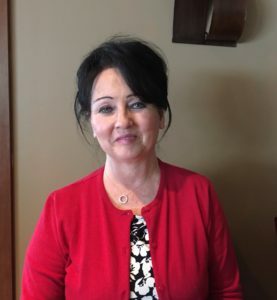 She was Vice Chair of the Susquehanna County Democrats for a number of years and she was recently appointed to the County Planning Commission. As mayor Nancy is currently focusing on her city’s blight. She is working with the Borough Council as they proceed to demolish non-viable buildings and to fix up buildings that are in bad shape but useable. Where rickety structures are removed, the goal is to replace them with affordable housing, possibly through TREHAB. The borough has a real need for affordable and suitable housing for families and seniors. Mayor Hurley is working with her colleagues to crack down on code violations in apartments to make them healthy and safe. The borough is also working to fix roads and streets by repairing drainage ditches and the like. In her capacity as mayor, Nancy is working with the police department and District Attorney Klein on anti-drug programs including the “Drug Take Back Program” where people can get rid of their unwanted drugs in a safe and efficient manner. So far they have already had 36 pounds of drugs returned through this program. Mayor Hurley and the Borough Council are working with many of the local churches and high school students on the city’s clean up efforts. The Susquehanna Community Development Association (SCDA) works with the Mayor and the Council to put on community events like the annual “Hometown Days” that now includes a popular 5K run and Music Under the Bridge. Mayor Hurley started a Community Awareness Committee that from their first “A Walk Back In Time” event attracted over 100 people who enjoyed looking at historical images of Susquehanna.